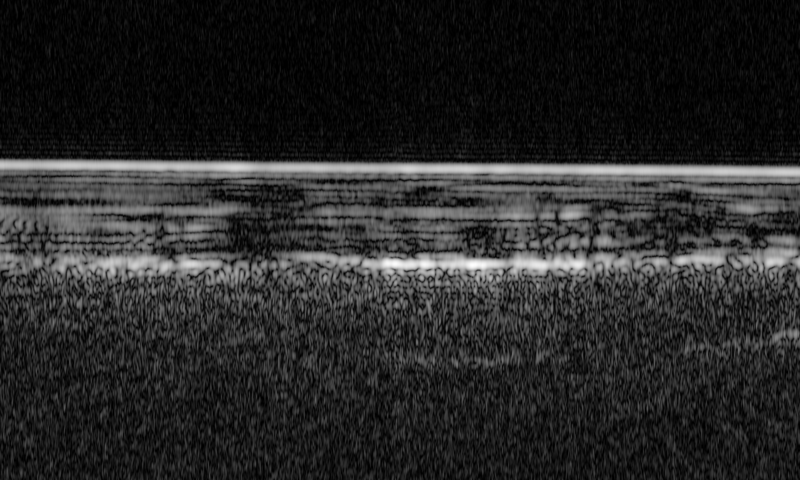 Above: ESA’s Mars Express has used radar signals bounced through underground layers of ice to identify a pond of water buried below the surface. This image shows an example radar profile for one of 29 orbits over the 200 x 200 km study region in the south polar region of Mars. The bright horizontal feature at the top corresponds to the icy surface of Mars. Layers of the south polar layered deposits – layers of ice and dust – are seen to a depth of about 1.5 km. Below is a base layer that in some areas is even much brighter than the surface reflections, while in other places is rather diffuse. The brightest reflections from the base layer – close to the centre of this image – are centred around 193°E/81°S in all intersecting orbits, outlining a well-defined, 20 km wide subsurface anomaly that is interpreted as a pond of liquid water. 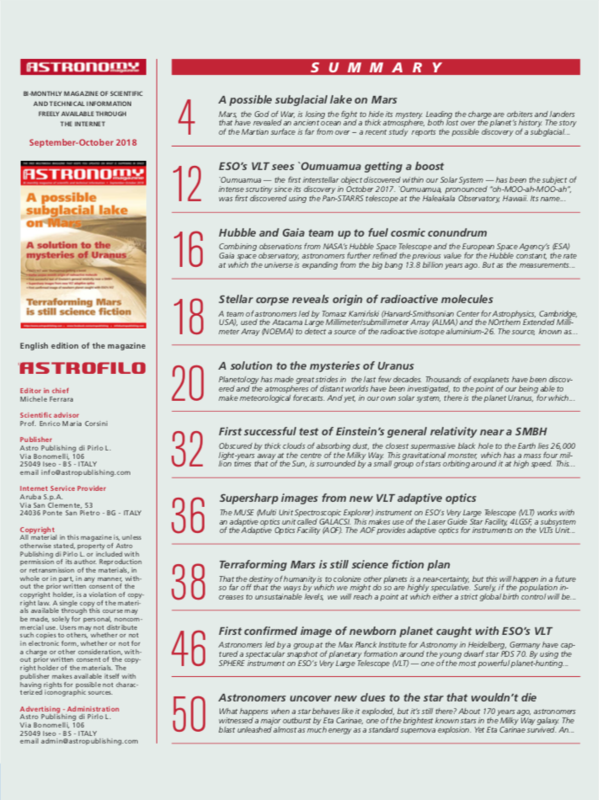 Image Credit: ESA/NASA/JPL/ASI/Univ. Rome; R. Orosei et al 2018. 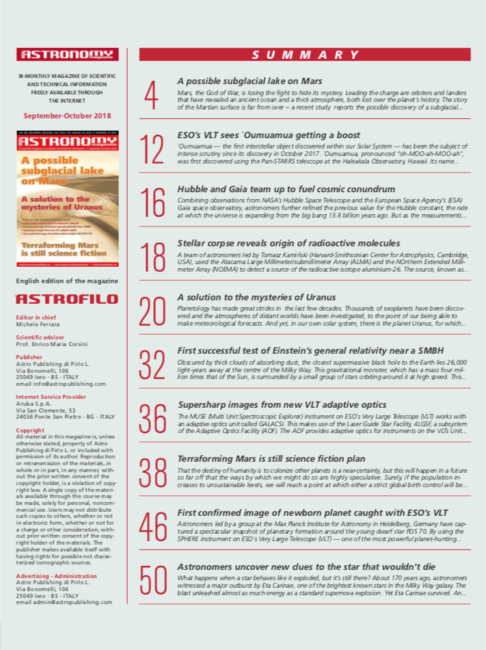 The September-October issue of Free Astronomy Magazine has been up for a few weeks now and I hope you were already aware of that from the CNY Observers post about the same. 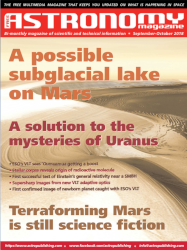 I’m also pleased to report a promotion from contributing translator to contributing author this month with the publication of the cover story “A Possible Subglacial Lake On Mars.” For the local record, a PDF of the article (with cover and edition TOC) is available for direct download at 5FAM2018_dgallis.pdf and I can now say that my work has been published in over three languages (four, to be exact, including English, Spanish, French, and Italian).